Fall is upon us! I have to be honest when I say I love summer, but there is something about fall that I love. The leaves turn, the weather is not super hot or super cold, pumpkin spice lattes return, and it is the start of the holiday season. Oh, and FALL FASHION BEGINS! The booties, scarves, sweater-dresses, the color of the season… fall fashion is the best part! Fall color, 2017: Fashions main colors are grenadine red, port tawny. For those like who have NO idea what those colors look like I’d call the C-burgundy Gandy, wine, and plain old red! Ha! Fall always leans toward any warmer and deeper color tones. These colors can be paired with almost anything and look vibrant and lavish! Fall Shoe Trend: It is all about the booties! Whether it is a pair of Dr. Martens, Timberlands, (which are uber hip and trendy) or a good ol’ fashion ankle bootie in this season’s color. Booties are where it’s at! Don’t forget about a casual tall boot, those always go great with a casual dress or a pair of leggings. Add a boot sock for a little extra kick. You can spice things up with a paisley print statement bootie that will turn an everyday outfit into an eye-catching one! Slides are still kickin’ it, big time. Slides come in so many styles, it’s ridiculous! I have a million pairs and as long as the sun is shining, I will still rock them with a cute pair of capri skinny jeans, a jean skirt or even a casual dress. 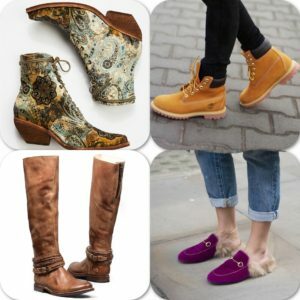 All of these fall shoes are FAB! 70’s wear: 70’s and 80’s fashion have made a comeback lately, and they are wicked cool. For example, old school Adidas, Nike, Puma or Reebok athletic wear, are all the rage. I’m so glad this trend is back! It’s comfy, easy and cute! I like to pair an Adidas hoodie with shorts during this time! Corduroy ANYTHING! Jumpers, bell-bottoms, skinny jeans; anything this style is must for this fall! Shirts: Statement Graphic Tees are so in! Plain shirts are cool, but a t-shirt with a funny saying or an awesome old school graphic is better. 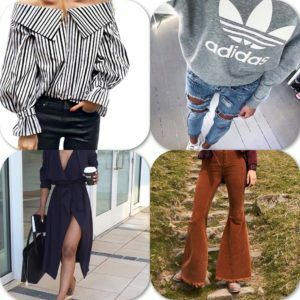 I love the ones that say, “always hungry” or “I ain’t got time for that.” Pair a tee with your bell-bottoms and skirts, then add an ankle bootie to be on point. Stripes and ribbed-knits are also hot! Stripes stand alone, and you can pair them with anything for a neat look. Ribbed-knits can also be dressed up or down for a super cozy, yet classy look. Classics, different cuts, striped-knits… it’s all groovy! Dresses: Wrap dresses are trendy this season; a plain one or a flower print with an autumn color is great. Pair it with cute booties or slides and for a more dressy look, a pair of pumps. Sweater-dresses… now, this is my JAM! Sweater-dresses are perfect in every season, except summer of course! In the fall, I take an everyday sweater-dress and pair it with a fun scarf and tall boots or booties. You can dress it up with heels or make it super casual with tennis shoes. I pair mine with fall colors by adding cute fishnet ankle socks, a bandana scarf, and Timberland boots. The perfect casual/cute outfit! A little bit of this, a little bit of that! I recently purchased the bell bottoms on the bottom right corner from Free People..LOVE! Accessories: Scarves! I LIVE for a good scarf. I think I have one thousand of them. You can pair a good scarf with pretty much ANYTHING and you’ll look fall-ready. Fun patterns, thick, thin, circular, fringe, faux-fur, it’s all good! Your scarf can be your statement piece. Take a sweater and jeans and pop a dazzling scarf with it and you’ll look like a million bucks! They are also the perfect way to keep warm when wearing something a little bit thin on top. BIG earrings, bracelets, massive rings and pendant necklaces are in! I am a sucker for over-the-top jewelry. 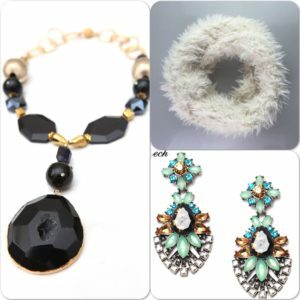 It is perfect that BIG is trending this fall; chunky statement bracelets, large rings and oversized earrings can set an outfit off. Metal, fringe, unique shapes, crystal, anything big and bold is nothing short of magnificent! Faux Fur scarves, chunky earrings and a big necklace, just a few of my favorite things! I hope you have taken some good notes and are ready to fall into fall, with style!